I belive in red birds. When my daddy died in 1989, I was knocked for a loop. I couldn’t find comfort and I missed him so. One day while my mother and I were sitting at her kitchen table, a beautiful bright red cardinal flew into the dogwood tree just outside her window. At almost the same time, we said “hello DeDe”. My daddy loved, fed, watched, admired and talked to cardinals, my “red birds” he called them. I felt a striking awareness that God had sent me just what I needed, comfort and the sense of my daddy in that red cardinal. Daddy has been dead for over twenty years. He still comes to me when I need him. After a painful divorce, when I was feeling alone as I ever had, a beautiful red cardinal literally flew from bush to bush around the oval track that I walked sometimes twice a day. 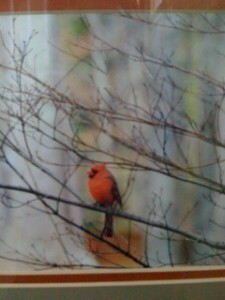 I began to talk with that red bird and felt God’s assurance that all would be well. So it has been that through the years, a red bird has found its way to a yard, or tree or window, to the beach, or the mountains; it has come in times of need and of celebration. When my mother was dying, there was the constant presence of a red bird just outside her window, and often, he would literally fly over to my car when I drove up. When Owen made his first visit to our home in Stone Mountain, as Paige drove the van up the driveway, there on the lamp post at the top of the drive, sat a bright red cardinal. DeDe welcoming Owen to the family. So it came as no surprise on a Saturday in July last year on the day of my mother’s memorial service, that in the tree outside our room was the fattest brightest red cardinal ever! When I spoke to it, that cardinal turned its head toward me and so I knew that all was well with Mother and would be well with me. While we get the male red bird the most often, now and again we get both the male and the female as Mother joins Daddy in stopping by. So it is that God sends us what we need–His steadfast presence and warm arms of love. We welcome your comments and questions about motivational events in your life, including those that seem miraculous. Just go to the end of the blog entry in the section below and click NO COMMENTS if none have been made, or if comments have been made click 1 comment, 2 comments, or whatever the comments button says. The comments section will appear. My popular motivational CD will introduce you to other people with uplifting stories. I produced the CD so you can benefit from their inspirational examples, as I have done repeatedly–and will continue to do. NOTE: You can order this message as an audio CD, or as a downloadable MP3, which you will access immediately after your purchase. Just scroll down the page until you find the description.